Peria Jerry—whose first name will forever be pronounced in Atlanta as “pariah”—is retiring from football after five meh-to-blech seasons in the NFL. The Falcons chose the Ole Miss product with the 24th pick in the 2009 draft, despite his missing the first month of his senior year due to knee surgery for a torn meniscus. They also ignored the fact that he’d be turning 25 before his first pro season ever began. His college injury would turn out to be predictive of his introduction to the Falcons. Less than a month after being drafted, he hurt the same knee in a minicamp. The same knee would give out two games into the 2009 season. In all, he’d play in 64 games in five years—mostly as a rotational player and a second fiddle to Corey Peters, who was drafted two rounds later in 2010. Now, if only to make myself feel worse, here is a list of Pro Bowlers who were drafted after Jerry in 2009: Clay Matthews, Jairus Byrd, Max Unger, LeSean McCoy, William Moore, Louis Vasquez, Mike Wallace, Henry Melton, Johnny Knox, Thomas Morstead. 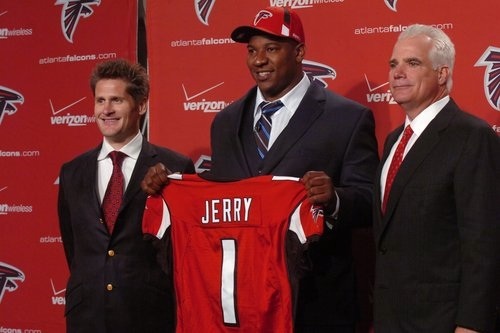 By the way, Jerry is not Atlanta GM Thomas Dimitroff’s biggest personnel blunder. That’s still the free agent signing of Ray Edwards. This entry was posted on Thursday, July 31st, 2014 at 8:11 pm	and tagged with Clay Matthews, Peria Jerry, Thomas Dimitroff, William Moore and posted in Atlanta, Atlanta Falcons. You can follow any responses to this entry through the RSS 2.0 feed.